AFCAT Application Form 01/ 2018 for January 2019 batch are available from 25 December 2017. The candidates will be able to fill the form through online mode. The candidates willing to appear in AFCAT 2018 test scheduled to be conducted on 25 February 2018. 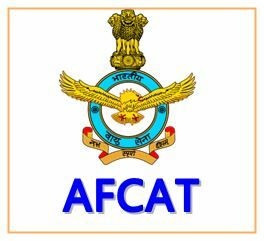 AFCAT (Air Force Common Admission Test) is an Indian Air Force exam that is taken after graduation for selection into Indian Air Force in Flying Branch, Technical Branch or Ground Branch. This page provides the step by step guide to fill the AFCAT Application Form 01/2018. Latest Update: Last Date for Online Registration and Submission of application of AFCAT 01/2018 has been extended up to 23 January 2018, earlier the last date to fill the application form was 14 January 2018. The AFCAT 2018 Application Process has started from 25 December 2017, the application process will be completely ONLINE. Candidates are advised to see the AFCAT 2018 notification before applying for Air Force Common Admission Test (AFCAT). The candidates are advised to take the following preliminary steps and read the notification for the relevant AFCAT examination given on the website carefully before proceeding with the application process. Registration Fee - The candidates registering for AFCAT entry will have to pay an examination fee of Rs.250. However, the candidates registering through Meteorology entry and NCC Special Entry are not required to pay an amount. AFCAT Application Process is divided into five parts, let us discuss the procedure to fill AFCAT registration form 2018 in detail. The steps given below will help the candidates to fill the form in correct manner. Candidates should ensure that all documents from Class 10th to their highest qualification are available for ready reference. The candidates are advised to keep a soft copy of their passport size photograph, signature, and fingerprint ready for attaching with their application form. The file size of the photo should be in between 10 KB to 50 KB in which the candidates’ head from the top of the hair to the bottom of the chin should be visible. The photograph size must be 2 inches by 2 inches, with the head centred on the frame. The candidates have to first Register on the official website of AFCAT or by following the given link. Click the 'Apply Online' button. After clicking on the apply online, the candidate will be directed to the ‘Candidate Login’ page in which the candidates have to register themselves as a new user by clicking the link ‘New Candidate’. The candidates need to fill the basic information to register themselves. They need to ensure that the details entered by them are correct before proceeding further. After registration, the candidate will receive the login credentials i.e. Username and password on their registered email id. 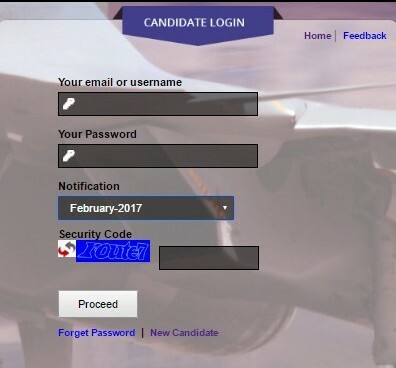 Candidates need to enter the Username and password which they received through email on the ‘Candidate Login’ section. Once the candidate has logged in, they need to fill the Online AFCAT Application form by entering the required details. The candidate will have to fill Part 2 of the AFCAT online application form by giving the required educational details, first specify the Education level and then give Details of Graduation and Details of 10+2. While filling the Part 2 of the AFCAT application form candidates have to Select Qualifying Education from Graduate Option A, B, C and D (details are given below in the tabular form). 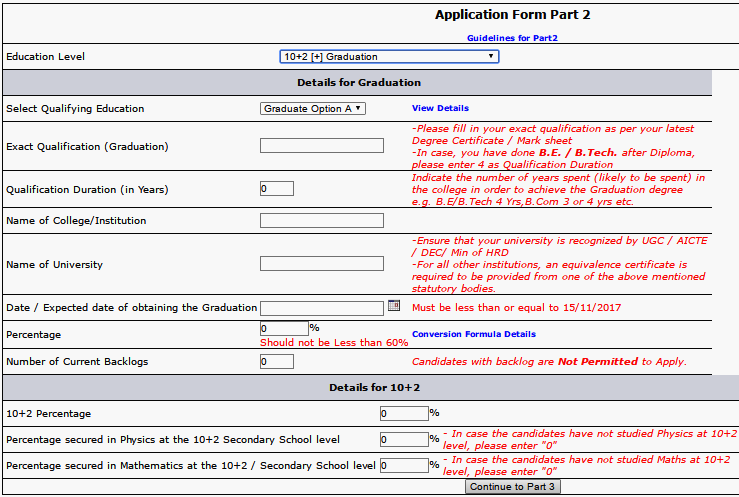 AFCAT Application Part 3, the candidates need to select the subjects they hold in the graduation or in any discipline. In this section, the candidates need to select their Choice of Course and Choice of Exam Centres. It is to be noted that the candidate only those courses/ branches would be displayed on the system for which the candidate is adjudged as eligible. This will be done on the basis of data provided by the candidate in the previous AFCAT application parts i.e. Part 1 and 2. This is the last section in which the candidates need to fill his/her Personal Details and have to upload their Passport Size Photograph, Signature and Thumb Impression (specifications given below) in the relevant columns. The candidates are advised to note down their registration number for further interaction with Indian Air Force. Candidates are also advised to keep their e-mail active till the completion of the admission procedure. Candidates are advised to check the details of the application form before the final submission because once the application has been processed then the candidates will not be able to do any changes. In case any information is found to be incorrect, the candidature is likely to be cancelled at any stage of the selection process. After giving details in Part 5 of Online Application Form the candidate have to preview and SUBMIT the application. The candidate must ensure that all entered details are correct and that the uploaded photograph is clearly visible. After the successful submission of the AFCAT 2018 application form, the application status would be indicated on the left side window through the message 'Application submitted to the Indian Air Force'. On successful submission of AFCAT Application form, the candidate will receive an e-mail in his/her registered ID which would be the proof of submission of application. Submission of more than one application will result in cancellation of candidature. 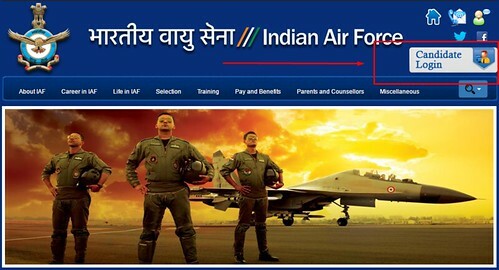 No hard copy of the application form will be submitted to the Indian Air Force Head Office.